A leader in virtual imaging, eMagin Corporation is the first and leading manufacturer of active matrix OLED-on-silicon microdisplays. The company also designs and integrates magnifying optics and systems to deliver a near-eye image comparable to that of a computer monitor or a large-screen television. 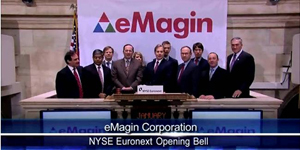 eMagin's products enable new markets for wearable computers, wireless communications appliances, portable entertainment, digital cameras, and many others. While these products [link] currently support industrial, medical, defense, and security applications, eMagin has also entered the consumer market with the Z800 3DVisor. Described by MaximumPC as the “the best 3D goggles we’ve ever tested,” the Z800 3DVisor brings the power of virtual imaging to consumers and points to new markets for eMagin’s virtual imaging products.